elcome to MOONWAVE, perhaps the world’s most innovative and sustainable luxury sailing catamaran. It is the manifestation of high tech, high speed, top comfort and endless fun. And it is sailing in the world’s most spectacular sailing venues. 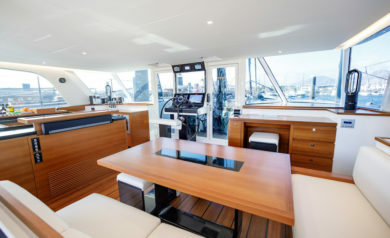 MOONWAVE is a recently completely refitted Gunboat 60 catamaran, designed by Nigel Irens, the iconic British yacht designer whose multihulls have set records and whose cruising boats are renowned for their classic looks and seakeeping abilities. Using state of the art materials, MOONWAVE was built to the highest standards and recently refitted in France by some of the world’s top boat builders with one goal in mind: Creating the fastest, smoothest and most comfortable ride on the water using only the power of the wind. At the same time, MOONWAVE is equipped with the most advanced hybrid propulsion system of any recreational vessel and offers essential high-tech amenities, maximum of comfort and lots of gadgets including 24/7 Internet connectivity, high-end entertainment and communication electronics. You can follow the boat right here on this site. You can browse videos images, follow our blog and subscribe to our newsletter, and learn more about our state of the art equipment and quiet motoring with our Deep Blue Hybrid System from Torqeedo. 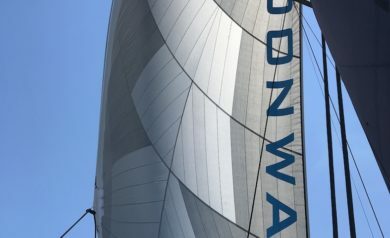 MOONWAVE offers sailing at it’s best and the possibilities are limitless: the thrill of steering and handling a fast catamaran on the open ocean or our experienced crew takes her to the best anchorages and secret coves while pampering the owner and his guests on board with five-star service. No matter what style of relaxation is prefered by the owner and his guests, MOONWAVE can offer it almost all. The only thing that doesn’t change is the commitment to making each trip and destination the experience of a lifetime. Modern and luxurious acco- mmodation on board for up to eight guests and two crew. Moonwave is great fun to sail and live on board! Sailing fast and safe in absolute comfort.